I am still reading the letters from Charlotte “Lottten” Westman to Augusta. Augusta and Lotten had been friends in Stockholm while attending private girl’s schools in 1842-1845. When Augusta moved back to her country home, Loddby, outside Norrköping, Lotten kept Augusta up-to-date on the social life in Stockholm. In the winter of 1845-46, she tells Lotten about the sisters Ulrich. Who were the sisters Ulrich and why did the family have to leave Stockholm? 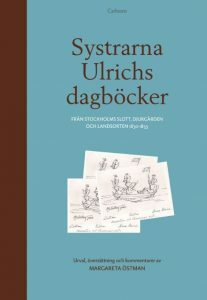 To my surprise and delight, I find a recently published book of the two sisters’ diaries – Systrarnas Ulrichs dagböcker by Margareta Östman. Lotten Ulrich (1806-1887) and Edla Ulrich (1816-1897) lived at the Royal Palace in Stockholm where their father, Johan Christian Henrik Ulrich, was the secretary to King Carl XIV Johan. When the king died in 1844, the family realized that their status would change and, in April 1845, they received a letter stating that they were now entitled to live at Kungshuset (The Royal House) in Norrköping. Lotten Ulrich was not excited about having to leave the Royal Palace in Stockholm for a house in Norrköping. Lotten Ulrich’s Diary, Norrköping, Thursday, 12 September 1845 (my translation of the Swedish text, translated by Margareta Östman from the diary’s original entry in French (Östman, 2015). “In Norrköping. This single word expresses the extent to which my destiny has changed since I last wrote in my diary. I’m no longer in Stockholm, in our dear little apartment in the Royal Palace, I am no longer at Gröndal, our beloved little rural home at Djurgården, these two places where I since my earliest childhood have spent my days; days that, when all is said and done, were happy, peaceful, and quiet No, I’m in Norrköping in The Royal House, eighteen [Swedish] miles from so many people and places that are infinitely dear to me and will remain so. It is here that I will now live my life, it is to this place we have traveled to live among people to whom we are indifferent and who are strangers to us. Lotten Ulrich was trying to deal with the family move, her father’s retirement, and Norrköping. On the 6 January 1846, she attended a ball at the city hall in Norrköping. It was a beautiful ball, but Lotten Ulrich was so depressed that she didn’t even enter the ballroom. I don’t know if Augusta ever did meet the sisters, and Lotten didn’t mention them again. Lotten’s grandfather was the pharmacist Carl Johan Fredrik (CJF) Plagemann. His brother, Conrad Ludvig Plagemann (1784-1842) was a custom’s officer at Saint Barthélemy. He had 14 children born on the island. The Ulrich sisters’ two brothers served consecutively as governors of Saint Barthélemy. Fredrik Carl (Fritz) Ulrich (1808-1868) was governor until his death in 1868. Bror Ludvig (1818-1887) then moved with his family to Saint Barthélemy and became the new governor. It is no surprise that one of Conrad Ludvig Plagemann’s daughters, Lovisa Albertina (1815-1899), would marry one of the Ulrich brothers, Fredrik Carl (Fritz). One of Conrad Ludvig’s sons, Arnold Plagemann (1826-1862) became a famous marine painter. In the late 1840s, he came back to Sweden and stayed with CJF Plagemann in Umeå. 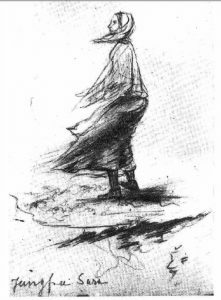 Some of his pencil drawings are included in the publication of letters between CJF Plagemann and his daughter Dorothea (Lotten’s “Dora”). Fritz Ulrich corresponded with his sisters and family in Stockholm. 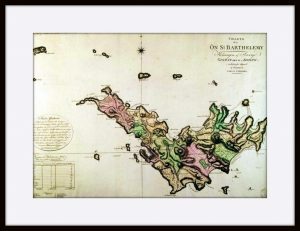 They eagerly awaited his letter with news from Saint Barthélemy. News about the growing family. And sometimes they got packages or sent packages. Lotten and Edla Ulrich describe in their diaries in 1838 how they buy a doll. 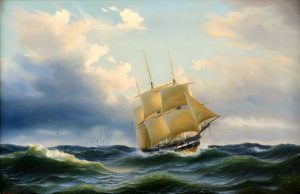 It is going to be a present for Fritz’s 4-year-old daughter, Edla Wilhelmina (Minna), and will be sent all the way to Saint Barthélemy. The body, which is 23 inches long, and the head are bought separately. The head has real hair and enamel eyes. The doll will be outfitted with clothes that the sisters and their mother are making. They are very excited about the project. Little Minna was actually Lotten Westman’s second cousin. How much did she know about her family in St. Barths? 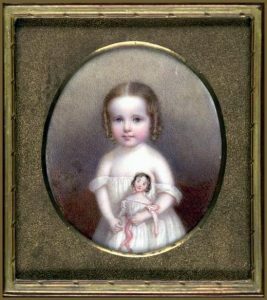 Sadly, Minna and two of her younger brothers died in a fever epidemic in 1841. In 1842, another daughter was born and given the same name. Seems like that was not an unusual custom. Östman, Margareta. 2015. Systrarna Ulrichs dagböcker – från Stockholms slott, Djurgården och landsorten 1830-1855. Stockholm: Carlssons. (Translation of title: The Ulrich Sisters’ Diaries – from Stockholm’s Palace, Djurgården, and the Countryside 1830-1855). 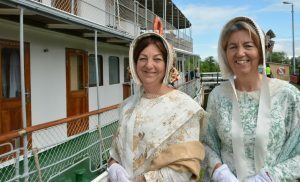 Watch our cruise with M/S Juno on Göta Canal!